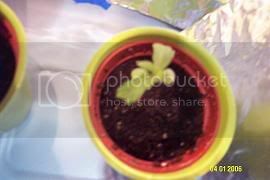 Discussion in 'First Time Marijuana Growers' started by smoka_lota_pota, Apr 26, 2006.
one day i was chilling in my backyard and i noticed a small plant in my dirt. i looked closely and i noticed it was a marijuana plant. "dont ask me how it got there, i just dont know" but i desided to grow it. i put it in a small pot and water it every other day.should i water it more. i dont have any grow lamps or anything (im too damn broke) so i kepted it outside. so far its grown some 4-5 inches. i was wondering if one of you out there would help me out with this. ill take any advice anyone gives me. The sun is better than any grow light you could buy. For watering, just stick your finger down in the soil, and if its dry like 2" in, water it. Make sure you have holes in the bottom of the pot for drainage though. im sure its pot ive seen it before ill get some pics too. would it be bad if some of the new leafs are a little brown/purp. i mean barely some of the leaves are brown. it looks as it grows the brown goes away. the color is at the bottom of the new leafs. ill keep you guys posted with new pictures every week.